UNITED NATIONS, January 30, updated below -- After the UN Security Council met on Monday morning about South Sudan, where 79 people were killed in an attack Saturday in Warrap State, US Ambassador Susan Rice came to the stakeout, ostensibly to focus on the Sudans, and then preview Tuesday's Syria meeting, which Secretary of State Hillary Clinton will attend. After Rice's opening statement, more than half about the Sudans including what the US has called a humanitarian crisis in Southern Kordofan, and a security crisis in Jonglei State in South Sudan, the US Mission and Rice took four questions: all about Syria. Video here. Some wondered, so how committed is the US, or even Rice, to Sudan, if it get dropped in favor of a future meeting with more media coverage but at which no vote will be taken? UK Ambassador Mark Lyall Grant, by contrast, took questions at some length from the press about Sudan. He said the UK supports the 7000 troop size of UNMISS, but wants it reviewed after one year. There is of course the question of if the UN moved quickly enough once the Russians told the UN in mid November that their military helicopters would no longer fly in South Sudan. Lyall Grant avoided any criticism, but answered Inner City Press say saying that now the UN is talking to five different troop contributing countries about helicopters, beyond the Ethiopians in the UNISFA mission in Abyei and "the Bangladeshis." Last week Bangladesh's Permanent Representative told Inner City Press that the UN had offered this country only a three week contract, and Bangladeshi gave only two military helicopters for all of South Sudan. On Monday Inner City Press asked UN Peacekeeping's Deputy Edmond Mulet if, in fact, it was only two helicopters. He nodded and held up two fingers. On Friday Secretary General Ban Ki-moon's spokesman Martin Nesirky referred Inner City Press to DPKO and DFS to answer when Ban knew that the Russian helicopters wouldn't fly, and when he began what he's called "begging" for alternative helicopters. But DPKO's answer didn't answer these questions, nor provide the similar date promised by UNMISS chief Hilde Johnson during her January 23 video briefing. Inner City Press asked Nesirky again at Monday's noon briefing, and still no answer was provided. It matters: South Sudan says that 79 people were killed in an attack Saturday in Warrap State, by a militia they say was armed by Khartoum. Nesirky said UNMISS is "not on a position to confirm" anything, and has only now "dispatched a team." Video here, from Minute 4. One would have like to ask US Ambassador Rice about this, and about whether the US will, in fact, act to get humanitarian aid into South Kordofan even without the consent of the local administration of Governor Ahmed Harun and President and fellow ICC indictee Omar al Bashir. UN - African Union envoy to Darfur Ibrahim Gambari recently greeted Bashir at a wedding reception in Khartoum -- click here for Inner City Press' story. One wonders what Rice and the US think of that. 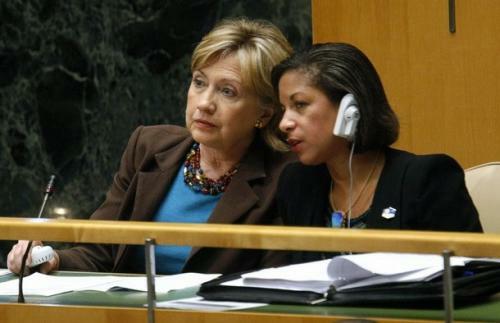 But Rice and the US Mission took only Syria questions after her "Sudan" stakeout. Afterward the Southern Kordofan question was put to the US Mission. When an answer is received, and to another question put to the US Mission Monday morning, they will be reported on this site. "We reiterate the call on the government of Sudan to allow full, immediate, unconditional access to all populations in Southern Kordofan and Blue Nile to avert what has the potential for, very soon, to be a full-scale humanitarian crisis. And obviously, were that not to happen, we would all be gravely concerned and have to review a variety of other options for dealing with the crisis that's unfolding." Update of 6:13 pm -- Separately, a Security Council diplomat said that the US is under great pressure to provide assistance to Southern Kordofan and Blue Nilem regardless of permission from Khartoum. Itwould be a grave step, and "not approached lightly." The US is said not to have yet made any decision in this regard, but has informed the Government of Sudan that it won't stand idle while a crisis unfolds. But after a Sudan meeting of the Council, it would seem that at least one of four questions taken could be about Sudan. Watch this site. Footnote: one wag remembering that Rice used to eschew Syria questions to stick to Sudan, for example, opined that with the media focus on Syria now and Secretary Clinton approaching, the calculus seems to have shifted. Hillary has confirmed she would leave the State Department in a second Obama term. The wag wondered: is Sudan now too low profile for a (prospective) Secretary of State? On the other hand it is argued that it was Rice and the US which raised Southern Kordofan and Blue Nile in the Security Council. It remains to be seen what the Security Council, and/or the US, will do about the humanitarian crisis and harm to civilians in these Two Areas. We'll cover it - watch this site.